Last week I had the opportunity to travel to paradise, also known as Palau, for a Mission Blue expedition. Palau’s territory encompasses 340 islands and some of the world’s greatest biological diversity. Three of the world's major currents collide here, creating a giant mixing zone that drives productivity for thousands of species. In 2009, Palau became the first nation to fully protect sharks in its waters and in 2015, put its entire Exclusive Economic Zone (EEZ) – all ocean under Palauan jurisdiction – under protection. Thanks to the conservation policies of the government, Palau is well known among divers for its vibrant reefs, which supports high diversity of corals, invertebrates and 1,500 species of fish. During this Mission Blue expedition we investigated and documented Palau’s marine protected areas successes and challenges. On the expedition, we also met with local conservationists, political leaders and partner NGOs to explore the issue of plastic pollution and to discuss ways to bring more resources to prevent further plastic pollution in Palau. We were on board the Ocean Hunter III, a boat full of accomplished people. Some of those people were Sylvia Earle (Founder of Mission Blue, marine biologist, deep sea explorer, and author), Fisk Johnson (Chairman and CEO of S.C. Johnson & Son, Inc), Rod Mast (President and CEO of the Oceanic Society), Glenn Bucksbaum (President of the Baum Foundation), Kip Evans (Director of Photography and Expeditions at Mission Blue), Brett Garling (Author at Mission Blue), Martha Shaw (Creative Director at Earth Advertising), Hayes Baxley (Videographer), Calvin Patel (Founding partner at Providence Healthcare Partners), and Julia Huisman (Oxford graduate). Dinner conversations were anything but boring with a group like this! Every day on the boat was better than the last. We spent the morning of our first day diving at German Channel. We visited a cleaning station and observed a few mantas coming in to be cleaned. On another dive during our first day, we were followed by a Napoleon Wrasse for the whole dive. On the second day we visited Jellyfish Lake. This famous lake in Palau is full of Golden Jellies that don’t sting. During our visit Sylvia and Fisk, who had been to Jellyfish Lake numerous times before, mentioned how the lake used to have many more Jellyfish - so many jellyfish that there was hardly any water in between. As a result of rising lake temperatures and climate change, the population had declined rapidly in past years. However the number of Jellies in the lake is back on the rise now and the population is recovering. On the third day, we were visited by the President of Palau, Mr. Remengesau! We started the day by having breakfast and telling President Remengesau what a great time we had been having in his beautiful country. Throughout the day conversations highlighted how well Palau is doing in conserving it’s waters. 80% of Palau’s waters are a marine protected area, while only 41% of marine waters are protected in the US (NOAA). Palau has also put a ban on plastic bags, and has recently put a ban on any sunscreen that is not “reef safe”. We ended this special day by all going on a dive together - naturally. On the fourth day we were lucky enough to see a bumphead parrotfish spawning! Wow! There were thousands of bumphead parrotfish swimming all around us. Suddenly a small group would break away from the pack and dart to the surface. Once they reached the surface, a white flurry would appear. This was a magical flurry, a flurry where fish babies were made. You could really feel the love in the water. What an amazing event to witness. The spawning wasn’t the only fun we had this day though! We ended this day with a few dives at blue corner where the current was pumping! But this was fine because we were all hooked in on our reef hooks. All you had to do was hangout and watch life go by. Hundreds of blacktip reef sharks, sea turtles, snappers, barracuda, parrot fish, napoleon wrasse, and more! On the fifth day, we spotted a huge pod of dolphins and pilot whales! As soon as we saw them we hopped in the water with our fins and snorkels to try and get a closer glimpse of them. I’ll tell you what though, those guys are way faster than you think. I didn’t stand a chance keeping up with them. To just be in the water, hearing them talking to each other was enough for me though. Throughout our whole week of diving, we would spend our surface intervals hearing stories from Sylvia about her experiences exploring and discovering the beauties of the deep depths of the ocean. We heard stories from Fisk about past dives trips with Sylvia and about the work that S.C. Johnson is doing to be more environmentally sustainable. We heard about Rod’s adventures researching sea turtles. Everyone was constantly sharing stories about how the ocean brought them to where they are today. 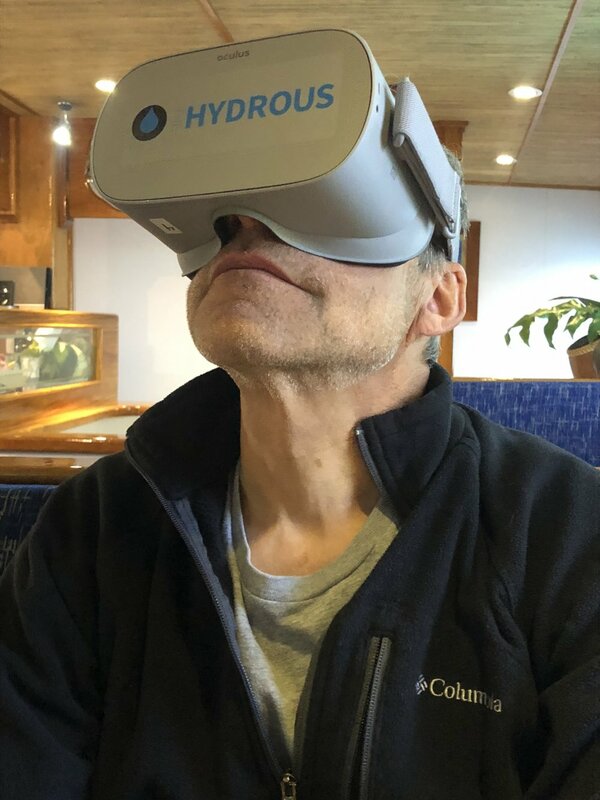 When it came time for me to share, I was sharing Immerse, and taking people on a virtual dive while we waited to jump back in the water for a real dive. On our last day of diving we visited a sunken 3-seater Japanese plane from WW2. It is an Aichi E13A-1 Navy Floatplane or as the Allies called it, a JAKE. Before WW2, two seaplane bases were built in Palau. The plane crashed during take off or landing after the engines stopped. It was so interesting to explore this little piece of history. We did our very last dive at Chandelier Cave which is a mostly underwater cave with four chambers. You enter the cave at around 20 feet and can ascend up to each of the chambers where there is an air pocket. When you emerge in these air pockets you can observe beautiful stalactites. After six days out at sea it was time to head back to land. Our first evening back on land, a reception was held for President Remengesau. Sylvia presented the first ever Blue Heart Leadership Award to President Remengesau for all of his efforts in ocean conservation. “It is totally fitting that you should be the first individual to be given this award because no individual has done more not just here in your country, but to inspire the world as a leader”, Earle said in her speech. The following day, we attended Palau’s first ever Plastic Pollution Forum hosted by the Heirs to Our Oceans at the Koror State Assembly Hall. Youth, citizens, local businesses, government officials, and more were all in attendance. The youth were mainly leading this forum. They brought up current issues facing the country related to plastic pollution, data to show just how bad the plastic pollution is all around the world, and then lead a discussion to brainstorm strategies that can minimize Palau’s single use plastics. Although it was sad to be reminded just how much of the ocean is being polluted by plastic, this forum was a good inspiration, especially as a designer, to take more action against our plastic use. When you see what kind of beautiful creatures live in Palau’s ocean, you can’t help but to take action. Sylvia Earle once said, “Even if you never have the chance to see or touch the ocean, the ocean touches you with every breath you take, every drop of water you drink, every bite you consume. Everyone, everywhere is inextricably connected to and utterly dependent upon the existence of the sea.” So take action - where ever you are, in whatever you’re doing. Lastly, big thanks to the Baum Foundation for bringing me along for this adventure. I was so grateful to have the opportunity to represent the Hydrous on this amazing expedition.